Not a stranger to Philips products, my kitchen has always been filled with reliable Philips kitchen appliances. I have had the honors of using Philips Pressure Cooker a few years ago and has always been pleased how it helps in shaving off hours of cooking time, yet yielding lots of delicious comfort dishes. The latest Philips All-in-One Pressure Cooker incorporates the functions of slow cook, pressure cook and multi cook all in one machine. The intelligent cooking system offers various cooking functions all neatly pack into this sleek design electrical pot. 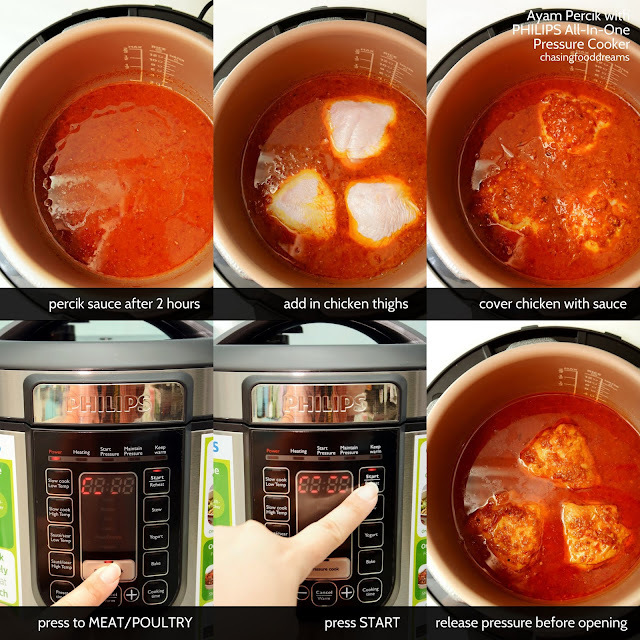 Thanks to innovation and technology, the new Philips All-in-One Pressure Cooker is one kitchen appliance that churns out one pot wonders with much ease. Thanks to Philips Malaysia, I am super thrilled to test out the Philips All-in-One Pressure Cooker with a recipe from Chef Marina Mustafa. Having attended her cooking workshop here previously, I know how easy it is to use the pressure cooker. With more added functions now, one can now whip up dishes with pressure cooking function as well as non-pressure cooking function. This means, you can saute, slow cook, steam, bake, reheat, warm up and more with just this pot. Assured and built with safety as priority, the Philips All-in-One Pressure Cooker has an auto pressure release device plus 9x safety protection systems for extra safety measures. 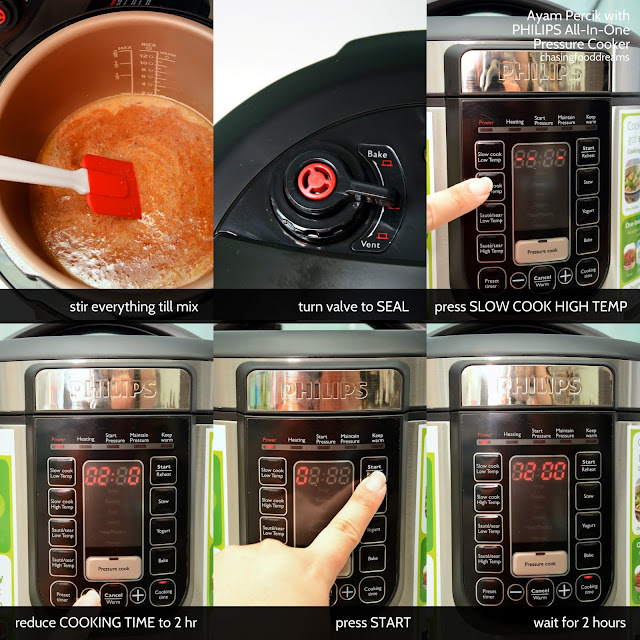 It is not only easy to use with simple click instructions, the digital panel also lets you know exactly the timing and status of the cooking. It is also easy to maintain and clean up with minimal hassle. The Philips All-in-One Pressure Cooker comes with 6 liter aluminum alloy inner pot, rice spoon, soup ladle, measuring cup, steaming plate and recipe booklet. 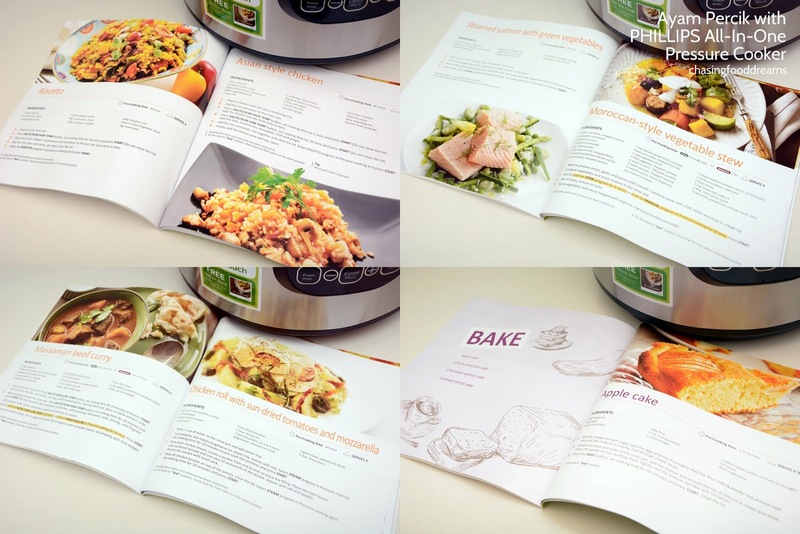 The recipe booklet is filled with lots of easy to follow recipes. One can whip up curries, stews, risotto, pasta, soups, cakes and even make your own homemade yoghurt! Let’s cook! I tried a recipe from Chef Marina Mustafa and true enough, making Ayam Percik was so easy that even novice cooks can do it. Most of the ingredients literally goes into the pressure cooker all at once and leave the rest of the cooking to Philips All-in-One Pressure Cooker. The Ayam Percik turned out so delicious and tasty. I even had time to settle other chores while whipping up this dish. The chicken was tender while the percik sauce was piquant and full of yummy spice notes with a creamy touch. The slow cook function on high temperature allows the percik sauce to really cook down to a thick and rich sauce before I added in the chicken. After that, it was only 15 minutes of pressure cooking to make the chicken tender and married it with the tangy and spicy percik sauce. I cannot wait to experience more dishes with my new Philips All-in-One Pressure Cooker, especially the yoghurt and lasagna recipe! 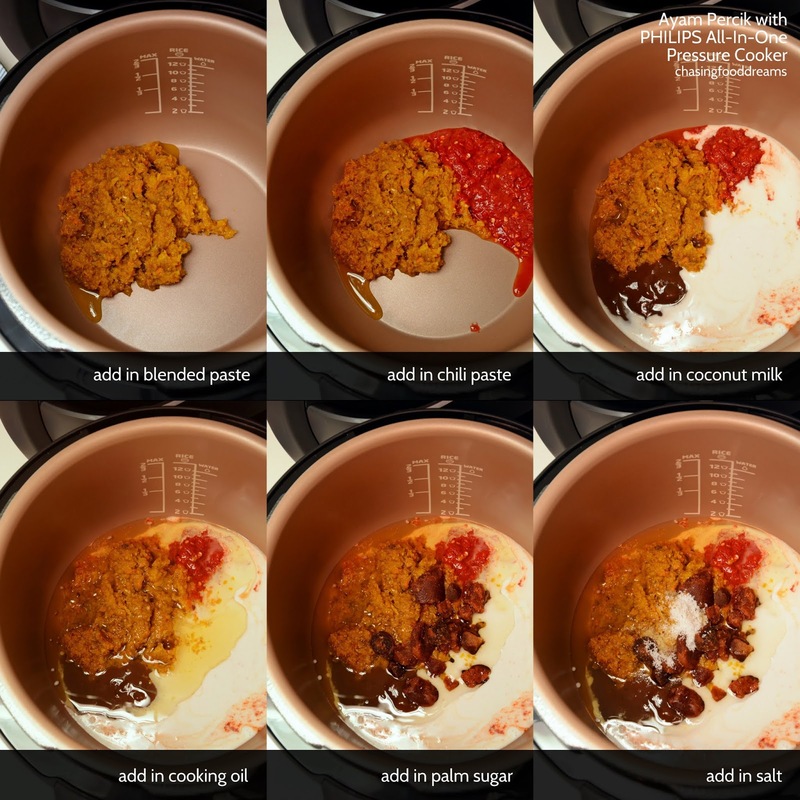 Put all the blended paste, chili paste, coconut milk, cooking oil, palm sugar, tamarind and salt into the inner pot of the Philips All-In-One Pressure Cooker. Close the lid and turn the valve on the top of the lid towards the SEAL position. Press SLOW COOK HIGH TEMP and then press COOKING TIME ‘-‘ four times to reduce the cooking time to 2 hours. After 2 hours, when the Percik sauce is ready, open the lid and add in chicken thighs into the pot and smother the chicken with the sauce. Press PRESSURE COOK till setting reads MEAT/POULTRY to cook the chicken for 15 minutes. When 15 minutes is done, release the pressure by turning the valve towards the right most towards VENT for steam release. Once the steam is all release, open the lid and sprinkle cilantro over the Ayam Percik and serve with your choice of rice, bread or lemang.